My computer and others I have tried will not recognized my phone so I can load music or pics. Hi, you didn't say how you are trying to load the music or files. I haven't tried loading them via a cable, but I have found two ways to do it - via Bluetooth or directly to the memory card. If you have a Bluetooth-enabled PC or one with a Bluetooth adapter, you can make a Bluetooth connection to the EX124g and transfer the files that way. In my case, my computer didn't have Bluetooth built-in, so I use a Trendnet USB Bluetooth adapter (any well-known adapter should work). Once the Bluetooth adapter has been installed on the pc, here's my procedure for getting stuff onto the phone. - Go to Menu -> Settings -> Bluetooth. Set the Power on and Visibility on. Select My Name to set a familiar name for your phone (the default is just "Motorola Phone" which can be a problem if there are other phones with that bluetooth name nearby. - Open the Bluetooth Utility and click "Add a Device". If your Bluetooth and Visibility are on, your phone should appear and you can select the phone to add it to your computer and click Next. Your computer screen will display the passcode that you have to enter into the phone to confirm the connection. After a few moment, the computer should say that the device has been successfully added. Open Windows Explorer and go to your Music folder. Select an album subfolder and select all the file in the folder that you wish to transfer. To select all the songs, you can click on the top file and shift-click the bottom file. With the songs selected, right-click with the mouse, Select Send To -> Bluetooth Device and select the phone from the device list. Once the file starts to transfer, the phone will ask you to accept the object exchange. 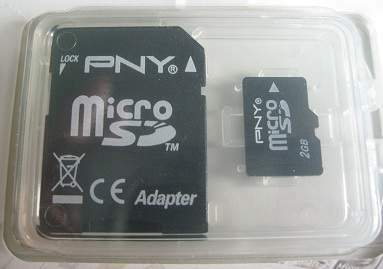 The other way to transfer it is to simply use the SD card adapter that your microsd card probably came with and insert the adapter with card into the SD card slot on your computer. Then you can simply drag and drop the photos and songs back and forth. Note, if you notice that the photos you've taken with your phone's camera are not on the memory card, that means that the phone is storing the photos in its internal memory. To change that, turn on the camera and click the icon on the lower right (if holding phone sideways) to configure the camera. 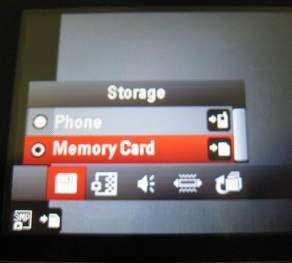 Then click on the last item in the row (looks like a wrench and screwdriver), then select the memory card for the storage option. Now future photos you take should be stored on the card and you will be able to transfer them directly to the computer as above.